Make PERMANENT FABRIC PAINT with GAC 900 medium. 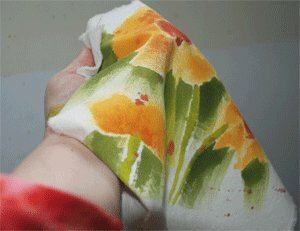 It's easy to make your acrylic paints turn into permanent fabric paint. On this page I'm featuring a medium that I particularly love! 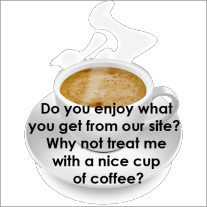 is a medium for fabric and clothing applications. It's a specially formulated acrylic polymer. By adding this medium to GOLDEN acrylic paints or GOLDEN airbrush colors you'll have great laundering stability. And it will keep the fabric very soft and supple. I mean you'll barely tell it's there!! It's why I love it so much! I mix puddles of the medium and the fluid acrylics about 1:1. I really enjoy the feel of brushing it on the fabric. As long as the areas are wet I can do some nice color blending. Nice. 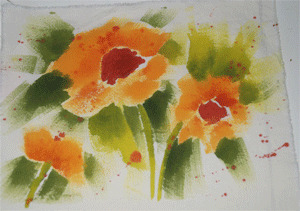 Some bleeding occurs and that's OK with me as in this loose abstract floral sample. GAC900 has to first air dry to the touch to form the initial bond with the fabric. Of course the ambient temperature and humidity levels in the room will determine how long this takes. As will the thickness of the fabric. Usually within a half hour has been my experience for things like denim shirts or T-shirts. Once air dry, you then iron the fabric for 3-5 minutes with a medium-hot iron on the back of the painted area. Iron longer and on lower heat for delicate fabrics. Oven-cure for 1-2 minutes at 300F or 4 minutes at 250F. Use your laundry dryer at high temperature for 40-50 minutes. When that's done, you have fabric paint that is permanent! Simple, don't you think? Let the painting dry thoroughly (at least 4 days) before washing. Note that hand washing is always the best method as it increases the garment's life. It also insures the permanence of the paint. If laundering, just turn the garment inside out. Use cold water in the gentle cycle and then hang to dry. Note: GAC 900 will release formaldehyde when heat-setting. Please ensure you have adequate ventilation. Do not heat-set near children or pets. Here's how to get back to Fabric Paints. Let's leave Permanent Fabric Paint and go to Fabric Painting Techniques.